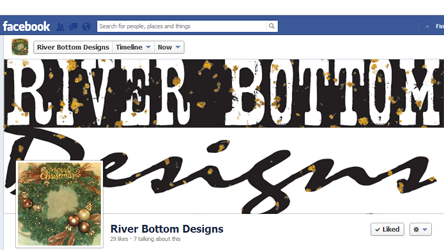 Welcome to River Bottom Designs! Thanks for stopping in to see what is new with us. We are just getting started and hope that you will continue to watch us grow. Don't forget to check out our Blog to see what we are up to! No matter the season, we have something to decorate your life. Check out the products we make and have made for our customers. Like something you see? Have a great idea but not the time to make it happen? We can help! We offer custom orders on all products we make and are open to putting our creativity to work on anything else you come up with. Interested but wanting to see items in person? Come find out where you can find us next!